Hello Friends, It’s Hump day for me…Wooohooo! I can’t wait for Friday to get here, Idk about you! The office staff at school asked me to make a quick baby card for one of our employees. I didn’t have a whole heck of a lot of time, so I through this together last night. Not in love with it, but they were, and that is all that really matters. The one button die (from Verve) at the bottom of the card came out red when it’s clearly pink. The sentiment is a mix of this and that and the cute little giraffe is something I picked up god knows where. I love the look of taking my rectangle stitched panels and putting them back together like a puzzle, however the panels have a little gap that I am not quite happy with on the bottom and I am hoping the word GIRLS has covered it up a smidgen. 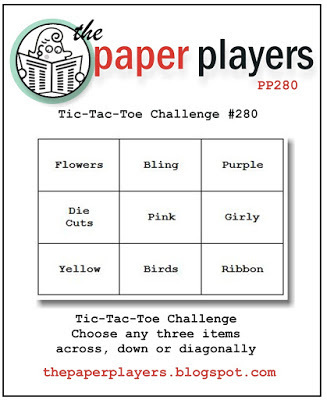 I am linking my card up to the Tic Tac Toe Challenge over at the Paper Players. I used the horizontal middle row of….Die cuts, Pink and Girly. Categories: Cards | Tags: baby cards, Card making, Cards, rubber stamps, stamping, Stamping Up, Verve Dies | Permalink. This is adorable and they should like it. You are too hard on yourself. Love it. How adorable! I love that layout and the cute pink giraffe! Oh my! This is a super sweet and girly card! I like how you placed the top sentiment in the corner over all of the rectangle layers. Thanks for playing with our Tic-Tac-Toe challenge this week. Nancy this is as sweet as sweet can be! Great selection of elements!